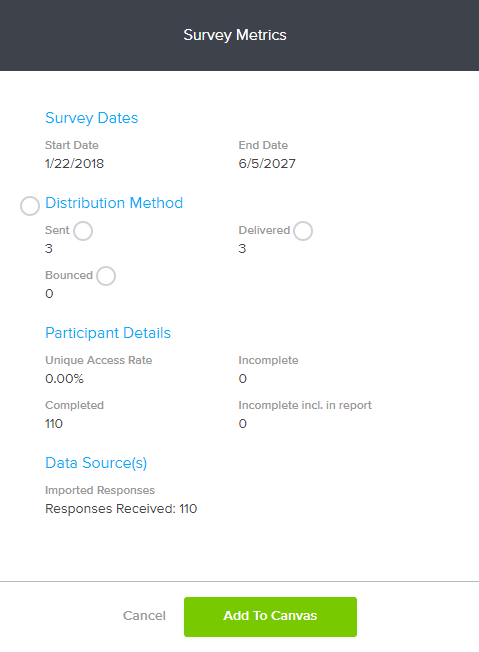 Update the way results are displayed by customizing questions, graphs, and metrics regarding survey participation. If at any point you’d like to clear customization and return to the default report display, click the Reset All icon on the right side of the screen. To edit question text content or formatting, click on the question itself. To add a question to the canvas, hover over the question and click on the Add to canvas icon. Apply Segmentation: Divide based on a Segmentation question and answers. To modify graph display or formatting, hover over the graph and click on the three dots that appear in the top right. You may choose to modify answer options, update graph appearance, or add the question to the canvas. To modify answers, click Answer Options from the three-dot menu. To edit text, hover over an answer option and click to modify. To rearrange the order of answer options, hover over percentage, select the small icon that appears to the right, and drag and drop to the preferred location. To merge answer options, check the boxes in front of each and click on the Merge icon below. To hide an answer option (without recalculating), check the box in front of it and click on the Hide icon below. To exclude an answer option (and remove it from calculation), check the box in front of it and click on the Exclude icon below. All changes will be reflected in both graphs and data tables for this question. To make the graph 3D, check the box in front of 3D Graph. To change the range displayed, choose from the dropdown menu next to Scale range. To update colors, select your choice from the dropdown menu next to Color Palette, and/or check the Reverse colors box. Updates will be made only to this graph. To replicate these settings throughout your report, click Apply to all graphs. To add this graph to your canvas, click the three-dot menu and choose Add to Canvas. To add a field to the canvas, hover over the text and check the bubble that appears beside it. Once all fields are selected, click Add To Canvas.